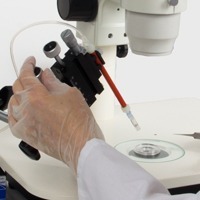 Micromanipulators are used when precision work is conducted under a microscope. A micropipette, electrode or probe can be mounted on a micromanipulator and move as little as a micron at a time. This tool can be used for in vitro fertilization, patch clamp experimentation, extracellular recording, microinjection and any application requiring fine mechanical placement (resolution). In addition to micromanipulators, WPI offers tilt bases, piezo translators and a variety of stands.